SOLD!! 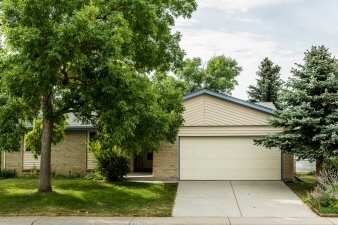 Pristine Rancher --Easy Denver Commute! This super-maintained home has had just one owner. The first floor boasts top-of-the line oak hardwood floors and carpeting. There is a wood stove to keep you warm and cozy on cold winter nights. The open floor plan adds to the spaciousness of the main floor. A large master bedroom and 2 additional bedrooms on the first floor give you plenty of room to spread out. On top of two more bedrooms (one would make an awesome TV room) in the basement, there is a large laundry area with newer washer & dryer, workshop and ample storage. Interior Features Retro 70s fully finished basement with Saloon, workshop, laundry and storage galore! Awesome place for the kids to spread out and play, or that adult child that just isn't ready to leave but needs their space, and even the guests! Exterior Features Level, landscaped, rear fenced yard with mature trees, rose garden. Additional Features and Amenities If you are looking for that cool 70s retro feel, it has been perfectly preserved in much of the house. If you are looking for a special home with lots of space and want to make it your own, this is it!